“Just inches away from homelessness and hunger.” Anyone in our community could end up here according to Sandy (not her actual name). I met Sandy in the line outside the Ferndale Food Bank. A dozen of us huddled under the heaters, early on a 50-degree morning. Two long benches lined the covered porch. Friendly conversation murmured around us while a college student occasionally popped out the door to freshen the coffee or to bring us freshly made hot apple sauce. Sandy was a registered nurse who worked as an emergency paramedic. Unbeknownst to her, Sandy’s heart was silently deteriorating. One day, a heart attack struck her. Instead of calling 911, she called her own EMT team who immediately arrived and took care of her. Fourteen stents later, Sandy could no longer work, and was forced to live on disability. From there, things rolled downhill to homelessness and hunger. This highly intelligent woman has been writing two books while living in her car. One book explores the homeless community in Whatcom County, which Sandy has had a very close look at. It may surprise you to know that our homeless community includes college-educated people who once earned six-figure incomes. Sandy, after five years of effort, has recently acquired housing. So, perhaps her writing can move swiftly toward bookstores now. To respect individual privacy, everyone in the food bank line is admitted when their number is called. I, however, was called by name because I had come as a reporter. The director, Suzanne, graciously paused her busy morning to talk with me. 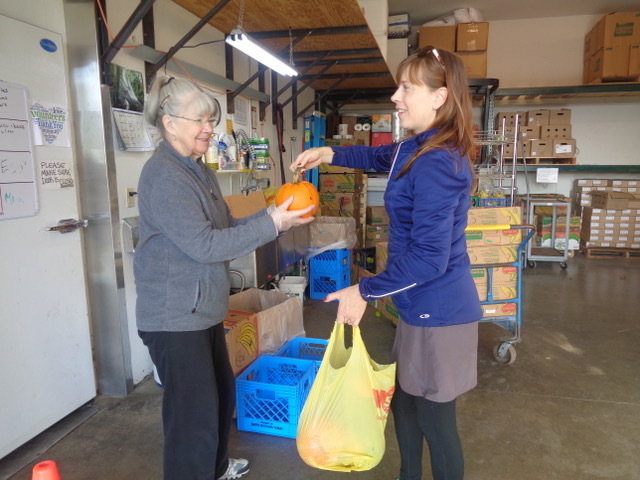 Suzanne formerly worked on Wall Street, and it shows in the way she efficiently operates our food bank. Donors and recipients will be glad to know that Suzanne, the only employee of the Ferndale Food Bank, can squeeze two or three dollars-worth of food out of every dollar donated. Whatcom County has five independently operated food banks. These are in Bellingham, Ferndale, Blaine, Everson, Lynden, Deming and Lummi Nation. Each of these 501(c)(3) nonprofit organizations operates a little differently, and each has its own budget and funding. The Ferndale Food Bank serves one out of every five people in its nearby community. In the past two years, the number of recipients has increased by 24.9 percent. More than half of the clients have at least one person in the family with a full-time job. But, despite the full-time job, they still need support from the food bank. Eight years ago, housing costs in Whatcom County ranked third place in our state, but wages were in 12th place. Now, Whatcom County is the fifth most expensive county, but is still only 12th for wages. Why? You could theorize about many causes. One of which may be the wealthy retirees who settle here and inadvertently drive up the cost of rent and real estate. I met one particular retiree who volunteers at the food bank. Elmer has a ton of energy and cannot tolerate being idle. He raises his grandson in a house that is walking distance from the food bank. Elmer has plenty of retirement investments and no need for extra income, so he enjoys spending his energy helping others. If you donate food, Elmer will be there to weigh your gift and offer you a tax receipt. Not long ago, I donated 27 pounds of extra produce from my garden. The food bank also receives produce from the Ferndale community garden, located next to Star Park. The Master Gardener volunteers also bring veggies, fruits and herbs that they’ve grown at Hovander Park. Other donors include local farms and nearby businesses like Barleans, Ferndale Grocery Outlet and Cargill. 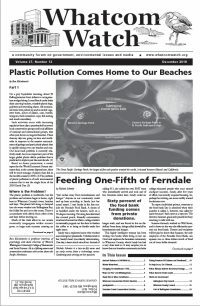 The Ferndale City Council is also very supportive of the food bank. Sixty percent of the funding comes from private donations. The rest comes from corporate support and grants. At the beginning of each fiscal year, the food banks receive federal funding, which can be used throughout the year to supplement the supplies when donations lag. Fall food drives help stock the cupboards through winter. At the end of September, the Industrial Credit Union hosts a food-truck event with live music and a beer garden. Entrance fees are collected and split among all seven of Whatcom County’s food banks. At the end of October, a haunted house event at Pioneer Park raises funds for the Ferndale Food Bank. The federal government also provides occasional and random food items. When I was a kid, we called this “government cheese.” But Suzanne says, “Oh, what I wouldn’t give for cheese!” Apparently, cheese is like gold now. Suzanne and her steady cadre of volunteers work creatively with their supplies. Each client is given the right combination of ingredients for three full meals per week — sometimes the recipes are offered too. Some personal requests can be honored, for example: gluten or dairy sensitivities. But mostly, the “shopping” is done for you. Items include food as well as diapers, feminine products, toiletries and pet food. How can you help? There are many ways. Volunteers are needed to help raise resources, for example, running local food drives. We need a group of invested stakeholders in the community who can approach local merchants for donations, especially drugstore items like paper products and toiletries. In the summer, many farms will offer excess produce, but gleaners are needed to go out and pick the items and bring them in. The Whatcom County Extension Master Gardeners Program is eager to acquire new disciples to train — and the “fruits” of their labor can be donated. You can also adopt a plot at the community garden where you can plant, tend and harvest your donations. Some local employers offer paid volunteer days. Or they will monetarily match your donations. Other creative ideas include community food drives. Designate one garage as a collection site. Put up signs in the neighborhood, stating every Sunday in December, your garage is open for donations. Another idea is holiday baskets. Or donate all of the ingredients to make a full meal like chili. Especially in the fall, they appreciate “holiday fixings” at the food bank to go along with the large quantity of donated turkeys. Keep in mind, that your money can go a long way at the food bank. For every dollar that you might have spent purchasing items for the food bank, Suzanne might have been able to double or triple that dollar’s buying power. Why not call and find out the current, most urgent needs right now? I saw one mother at the food bank with a brand-new baby on that chilly morning. I hope the food bank had diapers and formula for her. Nichole Schmitt is a late-in-life mom and an early retiree from a technology career. Gardening and writing are her passions.